When properly supported, the body can maintain its normal balance during stress, helping us to remain energized and focused. Increasingly overwhelmed by stress, however, our bodies seldom get a chance to restore our natural equilibrium. An estimated 75-90% of visits to primary care physicians are now related to the effects of stress. Adrenal Energy Formula combines four known stress-modulating extracts—Holy basil, cordyceps, Bacopa, and ashwagandha—each scientifically validated to support homeostasis, even on the most stressful days. Each of these extracts modulates a different set of stress related changes in the body’s chemistry. Combined, they may complement each other to provide complete adaptogenic stress defense. 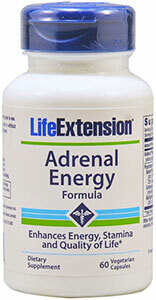 Recommended for Adrenal Fatigue and individuals who are stress sensitive. Take one to two capsules twice daily with or without food.